This, is the director/producer/writer/art director Shinkai Makoto's (新海誠) latest film, whose portfolio include 5 Centermeters per Second, The Place Promised in our Earlier Days, Voice of the Distant Star, and both Ef series. As a producer/director/writer/art director, he is famous for combining beautiful background, intricately crafted stories, strong emotions, along with extraordinary background music into a single package to create an unforgettable experience. His latest work, is no exception. Having said that, however, I have to say that I just can't help but notice that early on, there are some distinct similarities between this story and Princess Mononoke by the frontier of anime movie production, Studio Ghibli. The difference, is that Hoshi wo Ou Kodomo has a much greater depth and the line between good and evil is much more vague. If you have been following my blog for a while, you'd know I am a huge fan of Shinkai Makoto's work, but not so for Studio Ghibli's films. I know many people out there disagree with me and consider Ghibli one of the greatest anime production studio. While it is true that Studio Ghibli's films are pretty and usually contain some moral that is good for people at all age, my problem with Studio Ghibli's films is they lack of depth and dimensions. In another word, the stories from Studio Ghibli's film are very one-dimensional. The most recent example being Karigurashi no Arrietty where there isn't really much of anything that would leave you with a lasting impression other than the awe-inspiring art works and the strong and blatant environmental undertone. 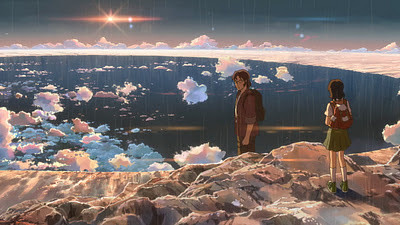 On the other hand, Shinkai Makoto's Hoshi wo Ou Kodomo, even though it looked simple early on, as the story went on, more and more dimensions were added to the core storyline and eventually became something much more than what it started. Even when so many things from this story seemed borrowed, the depth and dimensionality of this story would make you agree that it far surpasses its concept origin, Princess Mononoke. Another major difference between the two studios' approach to stories is that Studio Ghibli's stories almost always have a clear cut between good and evil--you can almost never misidentify the good from evil nor would you ever be able to take the side of evil while still stand on moral high ground. On Shinkai Makoto's side, however, it's much harder to judge the motives of a character to have it clearly placed in the land of good or evil--there are always much of the good intents that are being achieved by ways that people may perceive to be evil, and what are presented to be evil almost always have intents for greater good. This moral indistinguishability is part of the reason why I love Shinkai Makoto's work so much. Anyway, back on the topic, in this film, you will see all that you would expect from any Shinkai Makoto's film: beautiful art works, an intriguing story, and spectacular background music by Tenmon that is always right on cue. But I have to say, as a personal preference, I think I like his works that are based on current world (or a world that isn't too far in the future) much better than his works that are based mostly on a pure imaginary fantasy like this one. I think his ability to make spectacular from real life is much more prominent than creating a completely new fantasy world. But nevertheless, this is still one good movie. There really isn't much more I can say about this story without spoiling anything, I would recommend just go watch it. To some, it may look extremely like a Studio Ghibli's film. But if you look carefully, the extra depth and dimensions is how you can tell it isn't. Disagree with me all you want, but I maintain Shinkai Makoto Produced films are much finer pieces of arts than Studio Ghibli's.